A solid of revolution is generated when a function, for example y = f(x), rotates about a line of the same plane, for example y = 0. 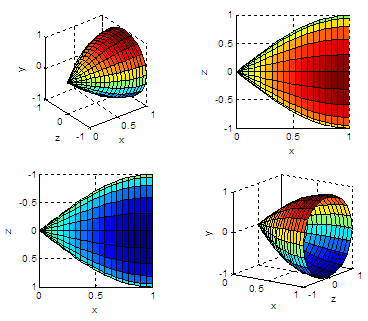 We’re going to show some simple experiments in Matlab to create 3D graphs by using the built-in function ‘cylinder’. The built-in function cylinder generates x, y, and z-coordinates of a unit cylinder. 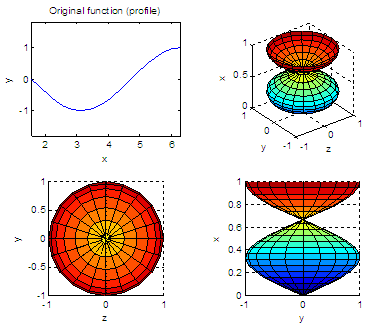 You can plot the cylindrical surface or object using instructions surf or mesh. Naturally, you can always type 'help cylinder' on your command window to see the explanation and examples of this function. 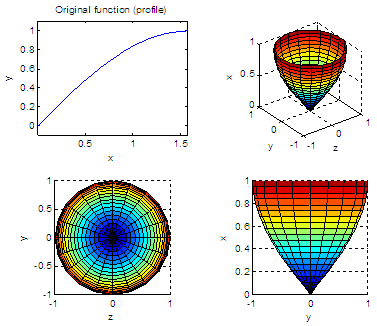 The basic format [X, Y, Z] = cylinder(r) returns the x, y, and z-coordinates of a cylinder using r to define a profile curve. cylinder treats its first argument as a profile curve. It’s important to note that the resulting surface object is generated by rotating the curve about the x-axis, and then aligning it with the z-axis. Let’s note that the shape or envelop is what we want. When we rotate the line, the x-limits are lost, and and become 0 to 1. We keep the idea for this 3D image, though. If we interchange the parameters for the surf function, we can achieve another views. We can play with coordinates and labels. Keep an eye on the axes, values and labels, so you can know what you’re seeing.